When two of New Zealand’s leading engineered timber design and manufacture companies, McIntosh Timber Laminates and TimberBond Industries, joined forces in November 2012, TimberLab Solutions Ltd was created. Now with a combined Auckland workforce of 35 staff operating out of the old McIntosh Timber Laminates 3500m2 plant in Bostock Place, and over 76 years of experience; TimberLab Solutions has the best of both worlds, combining McIntosh’s extensive experience in manufacturing structural laminated timber for commercial use and TimberBond’s expertise in residential use of glued laminated timber (Glulam). The result has been a “greater perspective towards ways in which structural timber can be applied to all building situations”, according to Owen Griffiths, TimberLab’s Sales and Marketing Director. TimberLab Solutions “aim to be the best provider of innovative, cost-effective and customised engineered timber solutions throughout New Zealand and to offshore markets”. They specialise in providing complete design-manufacture-installation packages for a wide range of timber projects, from small one-off sculptures to large industrial buildings. Being New Zealand’s largest and most experienced manufacturer of Glulam building systems, TimberLab’s Bostock Place premises showcase some of the capabilities on offer with Glulam portal frames, Glulam gantry beams, and reverse-curved Glulam beams featured throughout. TimberLab Solutions also have a high focus on quality, which would usually make it more difficult to provide cost-effective customised solutions as set out in their mission statement. However, they manage to achieve these objectives through careful design work and quality control from start to finish. “You can have two solutions for the same building, but because the designer is unfamiliar with the product and what it can do, they tend to be conservative in their design; therefore more expensive. Because we’ve had experience, we can provide a better value solution. “It’s a matter of being able to choose the right solution for the right challenge. We have saved up to half a million dollars on some projects by being able to advise on appropriate design possibilities” says Owen. Part of maintaining their high quality products is in sourcing the right materials. TimberLab only uses timber from sustainably harvested plantation forests in New Zealand, ensuring an environmentally responsible construction option which is backed by the FSC (Foreign Stewardship Council) Chain of Custody Certification. This focus on providing high quality products has led to TimberLab Solutions achieving a number of “firsts” for New Zealand in recent years. Within the last year, they have commissioned a 5 axis CNC Gantry machine; the first of its kind in New Zealand and Australasia. Another New Zealand “first” for TimberLab is the innovative multi-storey post-tension timber structures that they have been working on in Christchurch, in order to achieve earthquake resistance. This is an area in which TimberLab has developed expertise over recent years, and sets them apart from many of their close competitors. TimberLab Solutions also recently finished working on the Tuhoe Headquarters in Taneatua, which was designed with the “aim of being the most advanced sustainable living building in New Zealand”. 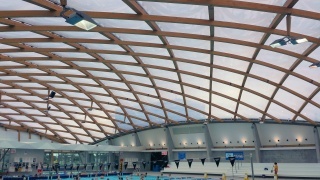 Other unique projects include a timber grid shell for the translucent roof at a newly built community swimming pool on the Kapiti Coast, and a three storey classroom at Sydney’s University of Technology made out of what looks like giant Jenga blocks and designed by world-famous architect Frank Gehry. While 65% of their production is for overseas markets like Australia, the Pacific, the Middle East, and parts of Asia, TimberLab Solutions would like to see more of a focus on the use of engineered timber solutions on their doorstep.